Are you Buying, Selling or Living in a house near to a substation and need to know about Electric and Magnetic fields? From the electricity system, high-voltage power lines produce higher fields than substations. In the population as a whole, not many people live close to (say within 100 m) a high-voltage power line. But for those who do, this will also be a significant source of exposure. More people live close to substation of one sort or another, but even if you live very close, they rarely elevate the field greatly - see more details below. The guidelines for public exposure are expressed in volts per metre (V/m) for electric fields and microteslas (µT) for magnetic fields. All substations comply with these limits - you can be right up against the fence or wall and still be compliant. There is no need for any extra “safe distance” between a property and a substation to achieve compliance, and there are no restriction on how close a property can be to a substation. Only about a half of homes in the UK with fields above 0.4 µT get that exposure from high-voltage power lines, and hardly any at all from substations – in the rest, the field probably comes from the distribution system or house wiring. If you do live very close to a substation, that may give you a higher exposure than the average home, but probably not above the 0.4 µT level. What sort of substation is near me and how near is “near”? 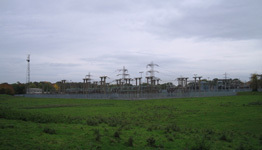 Large National Grid substation - hundreds of metres across. 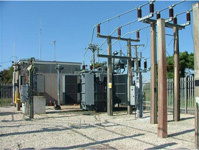 Different versions of final distribution substations - outdoors, in a building or on wood poles. For a large National Grid substation, you would need to be within metres or maybe tens of metres of the perimeter to get an elevated field. It would be rare to live that close in a rural setting but could happen in an urban setting. But you would probably be getting a higher field from the lines or cables entering the substation. 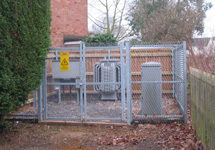 For the smaller substations, again, the field is usually only really elevated within a few metres of the perimeter. So it would probably only affect you if you literally lived next door. All the fields comply with the exposure limits - see below. All substations comply with the exposure limits, and remember, these exposure limits are set by independent international experts, not by us in the electricity industry – we just make sure all our equipment complies with them. There is some evidence of a possible risk of childhood leukaemia below these exposure limits, at levels produced close to some substations. This is just a possibility – we’d probably say the balance of evidence is against health effects – and it’s not considered strong enough evidence to restrict such exposures. It is for each person and family to decide for themselves how they you feel about this based on the evidence. Remember, a home would have to be very close indeed to a substation to get these elevated exposures from it. A nearby substation will be one of many factors you’ll want to take into account when considering a house, just as you would any nearby roads or railways lines, or industry, or anything else in the area. Some people may be put off, but the evidence is that houses near substations do still sell. A surveyor may point out the presence of a substation in a survey report and may even allude to possible health effects. But they should not recommend refusing a mortgage, and whilst mortgage lenders always have the right to make individual assessments, there is no general policy against mortgages on homes near substations. Sometimes, an automated online environmental search on a property may report the presence of a substation. See more on these reports and how to interpret them. This page is about homes near substations - see the parallel page for overhead lines.